Catena. 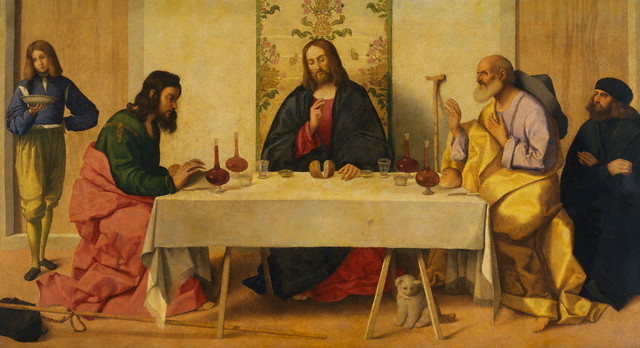 Is that some other random supper with Jesus, or the beginning of the last supper before everyone showed up? 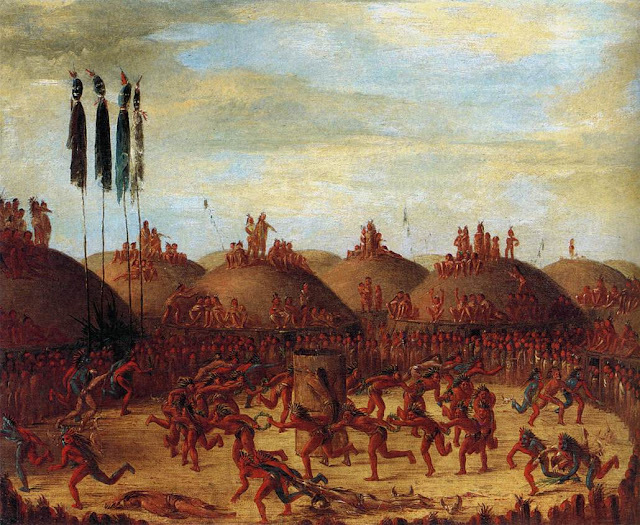 George Catlin. One I've always liked is the Ball Play (lacrosse) of the Choctaw. Caitlin. The title/painting info might help to appreciate some of these fine pieces of work. I am unable to vote because the Catlin hasn't properly loaded, but I send fond greetings to M5K from a distant land of many glaciers and a few iffy signals. I'm not able to give or receive emails, but I can at least read of your mix tape offer. All is well. Hold down the fort! Hi, Mrs.! Everything's good here! Catena. I like the guy and the sky. I'm going with an unhesitant vote for Catena. Catlin is clearly the better explorer of the two, but since we're voting on art I gotta go with Catena. One of the things I like best about Catena is that the first picture is such a great example of pre-Raphaelite work. At least, that's what I thought at first--the colors, and the hair of the page, and the animal (is that a kitten? I had problems finding a good close-up) under the table all said pre-Raphaelite to me. 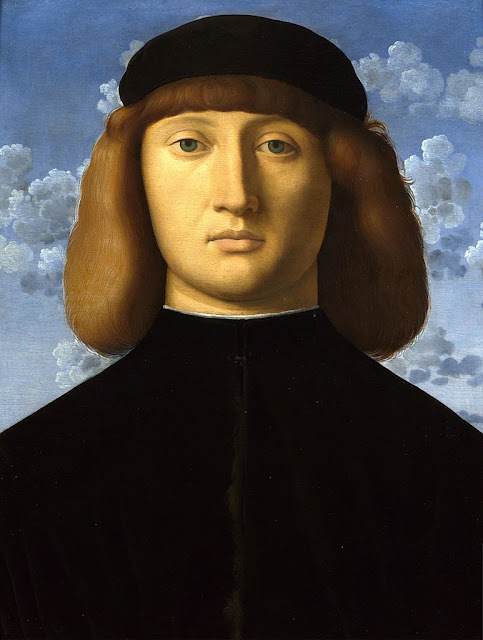 Of course, as everybody else here already knows, no doubt, he's a contemporary with Raphael, so at least there's some kind of bumbly connection I got right. By the way, I love the table setting--as much as those painters (contemporary with Raphael and pre-Raphaelite alike) love showing off their mad textile-painting skillz, check out that tablecloth. It's so short it shows the plain wooden supports underneath, and it says "humble" to me. It's the--I assume there's a name for those ruby and citrine colored corked drinky thingies?-- Are those personal decanters or something?--decanter-looking things on stems that I want for my birthday. Anybody know what's going on with the pole and the bag to the front left? Fortunately, Catena also painted Sky Boy, because I would have had real problems judging between Catena 1 and Catena 2. So, my mind was already kind of made up before I even saw Catlin, but then I did waver. 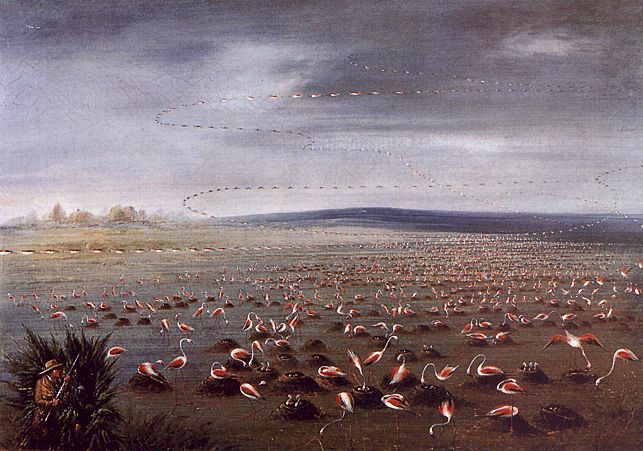 I love the lariats of flamingos in the sky in the first, and the gorgeous masses of settled birds and their nests, and then seeing the hunter--and it actually took me a while to see the hunter right in plain sight, which I think is pretty masterful of Catlin (or clueless of me, or something)--literally makes me want to yell to scare the birds off, but I wouldn't want them to leave their young in the nests, either, so the drama is rather intense in a subtle way. Result: vote for Catena, but a respectful nod to Caitlin. Even if we only let Leonardo Piccioni vote once, Catena still takes it 8-4, and will advance to take on Mary Cassatt.